JNN 17 June 2014 Islamabad : The Pakistani army has launched a Major operation against Terrorist in North Waziristan as per the Wish of every Patriotic Pakistani , near the Afghan border.While the PML – N led Govt has also reluctantly endoresed the Operation “ Zarb e Azb ” . The operation, which began on Sunday, involves the air force, artillery, tanks and ground troops. It came hours after Pakistani fighter jets carried out airstrikes against militant strongholds in the mountainous Dehgan area. Military officials said about 80 militants were killed in the attacks. Among them was the Uzbek leader Abu Abdul Rehman al-Maani, the Master Mind of the deadly attack on Karachi airport a week ago, they added. “Our valiant armed forces have been tasked to eliminate these terrorists regardless of hue and color, along with their sanctuaries,” the army said in a statement. It is not clear how many ground troops will be involved, he adds, but military experts warn it will be a complex and challenging operation. One of the last areas in the restive north-west where a large-scale push against insurgents has not taken place. The army later said troops had encircled militant bases in the towns of Mirali and Miranshah but it was unclear if fighting was under way. Afghan security forces have been asked to to seal the border on their side, officials said. As per our Correspondent The army said a No. of Terrorist hideouts were destroyed killing atleast 185 “terrorists” upto date , most of them Uzbeks & Foreign terrorist ,who have for so many years taken refuge in these Mountainous Regions and were involved in the Planning and execution of Terrorist Activities , across Pakistan , and also in the Foreign Countries. Pro-Taliban terrorists have carried out numerous attacks against security forces as well as civilians, and managed to spread their influence in various regions of the country as per the statement of the PML – N Govt Minister Rana Sanaullah , there are atleast 175 Terrorist Sanctuaries in the Province of Punjab only , despite sporadic offensives by the Pakistani army. 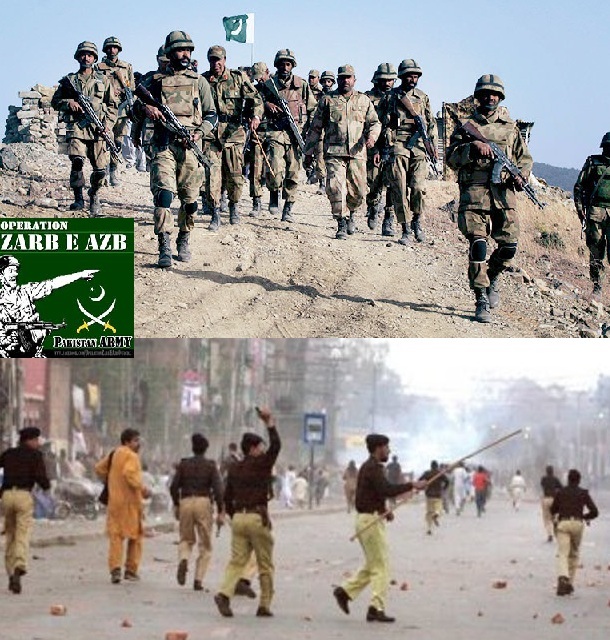 The Army’s Action and Decision to Carry Out a full Scale Operation against the Taliban Terrorists , was fully and Open Heartedly Welcomed and Supported by All the Major Political and Religious Parties of Pakistan , accept a few who accepted the Army’s Decision of an Operation , but still presented their reservations against the Operation , which Includes the same Parties , who were always against the Army Operation , and have always supported the Taliban Terrorists in Letter and spirit , and in all the ways , Namely they were Jamaat e Islami , Jamiat e Ulema Islam – F , Jamiat e Ulema e Islam – S , and Lastly Pakistan Tehrik e Insaaf , who have registered their reservation against the Operation . But even then have said that they support the actions of the Pakistan Army. As on the Middle of the Night of 16th and 17th June , they raided the House and the Central Secretariat of Pakistani Awami Tehrik , Led by Allama Tahir ul Qadri , in the Model Town area of Lahore City , on the Plea of Removing the Barriers and Barricades Erected around the Residence of Allama Tahir ul Qadri and Central Secretariat of PAT , which were erected on the Orders of the Punjab High Court , for the security and the Safety of the People of that area. This act of Pressurizing the PAT , was resisted by the supporters of the PAT , and a heavy Protest was launched by them against the LEAs and Administration , which has come with full readiness and force to remove them . And as the Protest continued till the early hours of Tuesday , the LEAs first restored to Tear Gas Shelling , which was countered by the Protesters by throwing stones at the LEA Personnel’s , and as the situation , was even then not controlled ,due to a Large NO. of Participants of the Protest , the LEA’s Personnel firstly Baton Charged the crowd and then started firing Directly at the Protesters , and finally till the Miday , due to the Heavy firing from the LEAs , about 8 People were Killed , including Women , and about 150 Injured , and as per the figures given by Allama Tahir ul Qadri , about 80 of the Injured were in critical Condition due to the LEA’s firing , and the No of Dead may rise , with the passage of time. The Independent Analysts are of the view that the Use of Such an amount of force on such a petty Matter of removal of the Barricades , which were even erected on the orders of High Court was Not Justified at all , and above all flaring a little issue into a Matter where 8 Precious Lives were lost , on the orders of the LEAs Personnnel , looks to be a Foreign Agenda dictated to the PML – N Govt , By their Saudi Sponsors ,who are Out rightly against the Army Operation against their Infested Taliban Groups , as they are working on their given commands of creating Dis Integration and flaring up chaos and Uncertainty in Pakistan . And as the Valiant Pakistani Army has already taken a Bold step , for cleansing of their Motherland with Menace of terrorism and Foreign Interference , which will be a great set back for the foreign Governments like Saudia , US , India or any other country , which are putting all their efforts for destabilization and Creating Chaos in the country , which is in their Best Interest . So PML – N Government Led by Nawaz Shariff which is being Run on the dictations given by their Major Saudi Sponsors , who have even Once Given Life to them , and have even rescued them in the hour of their need , now Paying Back with the Interest , and trying to create a Situation within the country , that the Army gets Disturbed ,as if the Internal Condition of the Country detoriates , then they Army Might have to take a step Back from their Full Fledge Operation against the Taliban , and thus the Agenda of the Countries Like Saudi Arabia will be implemented , and the Army will fail in the complete cleansing of the Country from the Menace of Terrorism , which is due to the same Taliban . Atleast 50,000 Pakistanis have lost their lives in bombings and other Terrorist attacks since 2001, when Pakistan entered an alliance with the United States in the so-called war on terror. Also, more than 5,000 Pakistani Police and Armed Soldiers have reportedly been killed so far . This entry was posted in Asia Pacific, Jafria, Pakistan News and tagged Barriers, Encroachments, Operation Zarb e Azb, Pakistan Awami Tehreek, Safety Barriers, Taliban Terrorists. Bookmark the permalink.